Responding to customer feedback, Scolmore has added a new product to its Click Deco Plus range of premium, decorative metal wiring accessories. The new Deco Plus Twin Socket with Outboard Rockers meets the growing demand for products that come under the assisted living bracket in terms of being easy to access and operate, and which are being increasingly specified across a range of building projects. 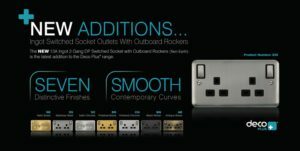 The 13A 2G Outboard Switched Socket features ingot rockers that are a standard feature on the Deco Plus range, double pole switching and twin earth, and it is designed to fit a 25mm BS4662 back box. The base of the socket has been modified to allow it to fit more easily into the back box. Launched in 2017, the Click Deco Plus range comprises more than 800 decorative metal wiring accessory products, which feature smooth, contemporary curves that appeal to contractors, specifiers and end users alike. As with the rest of the Deco Plus range, the new twin socket with outboard rockers will be available in seven finishes – Antique Brass, Satin Brass, Polished Brass, Satin Chrome, Black Nickel, Stainless Steel and Polished Chrome – and come with black or white inserts, to maximise the choice and offer suitability across an array of furnishing styles and tastes.